NAIROBI, Kenya (AP) — Kenya is risking sanctions from the IOC after the sports minister said he had disbanded the national Olympic body and three of its senior officials were arrested and face a criminal investigation relating to alleged abuse of office during the Rio de Janeiro Games. National Olympic Committee of Kenya chairman Kip Keino warned Monday of repercussions from the International Olympic Committee if he was also put under arrest alongside the three officials. He suggested it was political interference in the Olympic body, which is not allowed by the IOC. "(The) IOC are waiting for me to be put in (jail) and when they put me in, Kenya will be banned. We will not take part in the next Olympics," said Keino, a two-time Olympic champion. The criminal investigation into the NOCK officials relates to alleged theft of team uniforms and equipment at the Olympics that was provided by sponsor Nike, prosecutors said. The officials are also accused of giving out games accreditations to people who were not part of the delegation. They were all arrested last week on returning from the Olympics in Brazil. Two of the officials, NOCK vice chairman Pius Ochieng and secretary general Francis K. Paul, appeared in a Kenyan court on Monday and were each released on $2,000 bail. They had been held in custody since Friday. The third man, Kenyan Olympic team leader Stephen Arap Soi, was also due in court but was absent, with his lawyers saying he was unwell and had been admitted to the hospital. Soi was released on bail on Sunday. A fourth official, Soi's deputy, was also arrested last week but wasn't involved in Monday's court proceedings. The criminal investigation follows a proclamation last week by the sports minister, Hassan Wario, that he had disbanded the national Olympic committee following a series of problems for the Kenyan team in the lead-up to — and during — the Rio Olympics. 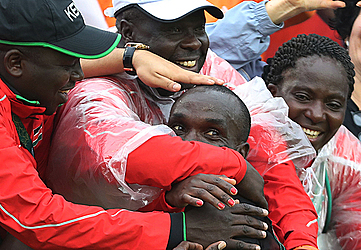 Following Kenya's long-running doping crisis, the track and field team manager was sent home from the games after allegations emerged that he had sought bribes from undercover reporters in Kenya in return for helping athletes avoid doping tests. A second Kenyan official was also sent home after being found using an athlete's accreditation to gain access to the Olympic Village. Some of Kenya's top Olympic athletes, including javelin silver medalist Julius Yego, were questioned by police after returning from Rio and asked to provide information relating to the charges against the NOCK officials.